Set up row: * Yf sl 1 yo, k1; repeat from * to end. Pattern Row: * Yf sl 1 yo, brk 1; repeat from * to end. Repeat Pattern Row until you have reached your desired length. - YF SL YO: Yarn forward, slip stitch yarn over. Bring working yarn to front under the needle, slip 1 stitch purlwise, bring working yarn over top of needle to the back. This produces a yarn over that crosses over the slipped stitch. 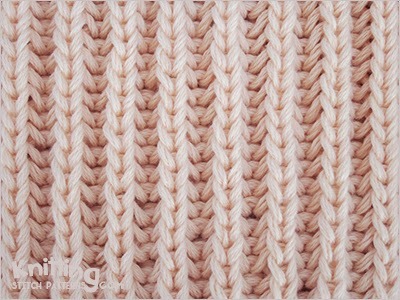 Knit the stitch that was slipped in the previous row together with its yarn over. Because the yarn over wasn't counted as a separate stitch on the previous row, no real decrease is made.